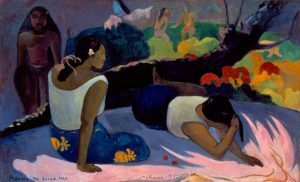 This art docent presentation featuring a favorite presenter (Marsha Holmes) will cover the artist Paul Gauguin. The de Young Museum in San Francisco is now featuring an exhibition of his work, which includes an exceptional display of more than 50 Gauguin paintings, wood carvings and ceramics, alongside oceanic art and other works from the museum’s permanent collection. The exhibition, and Marsha’s presentation, explore the artist’s spiritual journey, including his relationships with his wife, other artists and people he encountered during his sojourns who shaped his development as an artist.